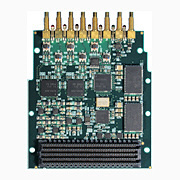 Pentek's Virtex-7 FPGA based family of FMC (FPGA Mezzanine Card) Carriers and FMC Modules (for data acquisition, software radio and digital signal processing), combine the high performance of the Virtex-7 with the flexibility of the FMC data converter, creating a complete radar and software radio solution. 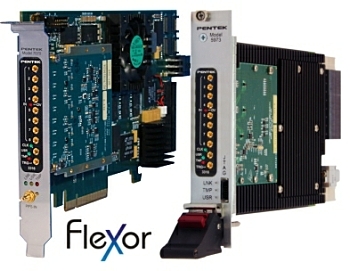 The Flexor Models 5973 & 7070 feature a high pin-count VITA 57.1 FMC site, 4 GB of DDR3 SDRAM, PCI Express (Gen. 1, 2 and 3) interface up to x8, optional user-configurable gigabit serial I/O and optional LVDS connections to the FPGA for custom I/O. It delivers new levels of I/O performance by incorporating the emerging VITA 66.4 standard for half size MT optical interconnect, providing 12 optical duplex lanes to the backplane. With the installation of a serial protocol, the VITA-66.4 interface enables gigabit backplane communications between boards independent of the PCIe interface. The Flexor FMC carriers come preconfigured with a suite of built-in functions for data capture, synchronization, time tagging and formatting, all tailored and optimized for specific FMC modules. Pentek's FMC (FPGA Mezzanine Card) modules have a high pin-count FMC connector which matches the new Virtex-7 FPGA carrier, boosting performance levels and adding flexibility.